It’s early morning at the Las Ramblas golf club. The early birds, the ones with the early tee times, are beginning to arrive. At first, the arriving cars trickle in but their pace increases as the clock nears 8 am. At this time of day, right before the sun rises over the hills, the light has a silver glow. It mutes the colors like a color photo on matte paper. There is a chill in the air. It’s November and the early morning temperatures can dip into single digits. You can tell the vacationers from the people who live here in Alicante. The vacationers are in shorts, short sleeve shirts and no jackets. They are on holiday from the Northern climes and a slight chill won’t stop them from getting their holiday sunburns. The locals are wearing jackets, hats and long pants. They know its better to take clothes off when it warms than not having anything to wear when the sea breezes come cold. Standing on the first tee you see strands of sunlight begin to light the fairway. Walking to your tee shot, the Spanish sun makes its climb over the barrancas and ramblas of this part of Costa Blanca beginning its job of providing warmth and light to the people underneath it. Today’s special treat is the way the rising ground fog turns the sunlight into streaks of silvery rays. Adding to the mystical ambiance the trees give off an additional vapor from the warming bark. The illusion is that the tree bark is smoking from an internal fire in the trees themselves. November also brings humidity to the coast and a heavy dew covers the golf course. The greens at Las Ramblas this day are dew covered but in sterling condition. Unless you’re the first group, an advantage to early morning golf are the trails in the dew left by previous putts. They will give you an excellent read of the break in the green. Remember, your stroke must be firm as dew slows the ball down. There will also be less break than the dry greens later in the day. 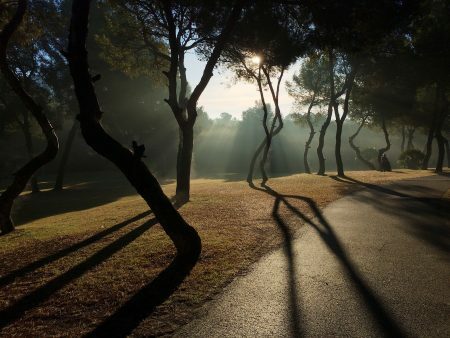 Early morning golf gives a sense of serenity at Las Ramblas. There’s a special light and long shadows from the rising sun. It is also so quiet. A silence only disturbed by the birds waking in the trees and the hum of distant grass cutters. You move through the golf course in a different frame of mind. At this time of day you get the feeling that Los Ramblas is your own private golf course. Only seeing the groups on the holes you’ve already played lets you know you’re not alone. The loss of privacy is replaced with knowing that your round is coming to an end. Perhaps there will be a twinge of regret soon replaced with the realization that it is still morning and you have most of the day to enjoy the other delights that Costa Blanca has to offer. While you can play early morning golf anywhere, playing at Las Ramblas is an indulgence every golfer deserves.